Over a million West African migrants, most of them Ghanaian, were forced to leave Nigeria at short notice in 1983. 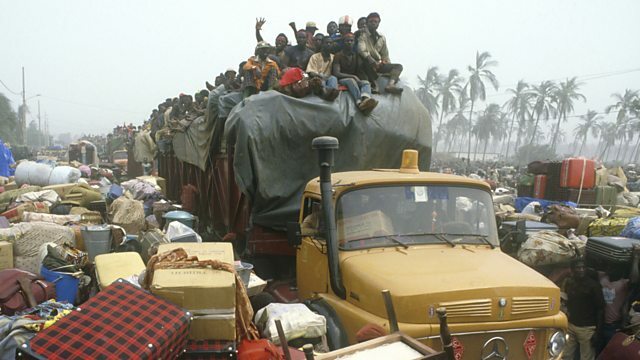 Over a million West African migrants, most of them Ghanaian, were ordered to leave Nigeria at short notice in 1983. The Nigerian economy was suffering a downturn. But hundreds of thousands of Ghanaians then found themselves stuck outside Ghana's border unable to get back home. Alex Last has spoken to one Ghanaian who took part in the forced exodus. Photo: Migrants leaving Nigeria wait at the border to enter Benin. Credit: Michel Setboum/Getty Images.